Modern people still go often to the country,to relax, chat with friends or simply being in nature, away from the bustle of the city. 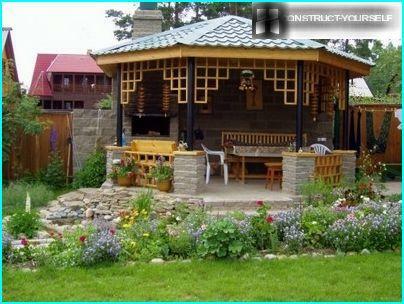 Sit in the company and to entertain guests barbecue particularly pleasant on the outside, but with amenities. Such conditions may provide a cozy gazebo right in the garden. Thinking about the construction of such buildings, each represents its own way. For someone looks tempting light wooden structure, overgrown girl's grapes. And someone really wants to meet and the New Year with relatives on a snowy cottage. 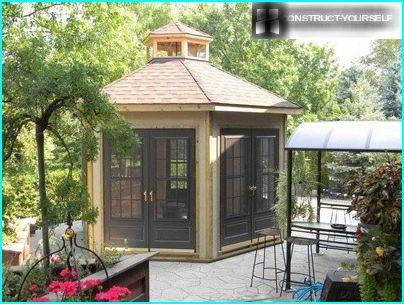 The best year-round brick gazebo for this purpose anything you can imagine. 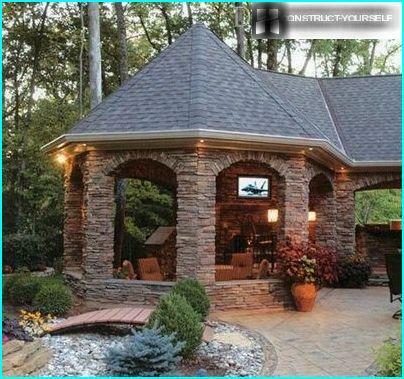 Brick gazebos are becoming more popular. To understand the cause of what is happening, let's talk first about the advantages of this construction. brick design is rugged and durable. 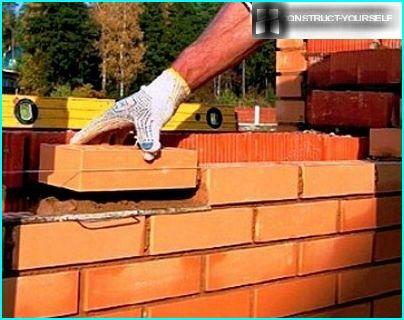 Brick - excellent material that does not require regular or special care. In the construction of this type will be guaranteed warm and dry, organize it really comforts of home is much easier than in a wooden structure. However, there are disadvantages, too, and they need to be mentioned. Built Thoroughness implies its massiveness. To its quality did not deceive your expectations, you should carefully plan everything, to build a solid foundation and spend a lot of money. 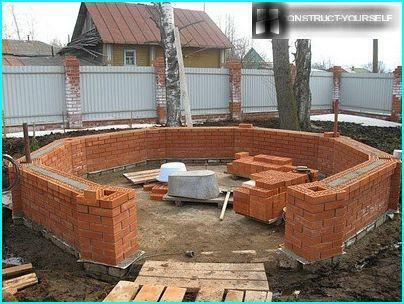 Time for the construction of the gazebo made of brick with his own hands will need more than the construction of structures made of wood. More want to dwell a little on the costs. 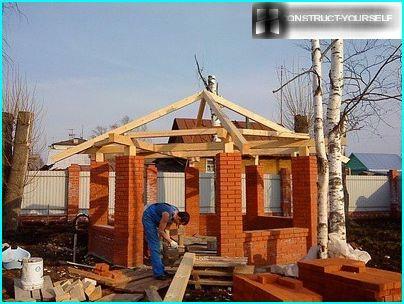 Yes, the design of brick to spend more money, but it is in the construction phase. 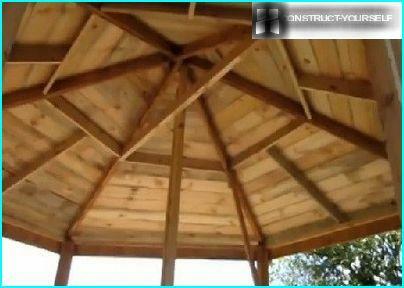 Over the wooden structure will need to take care of constantly. Before starting work, you must determine the type of construction being built. It is a matter of principle, since the choice depends on a type of foundation that will lay. closed, in fact, is a small house type summer kitchen. When making a choice, it is necessary to ensure that future construction will not be discordant with the overall landscape design area and harmoniously complement it. The concept of the future structure should be unifiedstyle solution to all the buildings sector. In addition, you need to decide what is the place for it can be isolated and estimate its shape and size according to their own needs and capabilities. 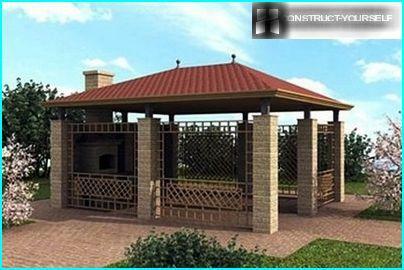 Before you build your chosen brick gazebo, make her scheme. After all, if something goes wrong, the capital structure will be difficult to alter. On the basis of the scheme is more convenient to do the calculation material consumption. No structural elements should not be forgotten. Think about what utilities you need. We recommended to carry out geodetic worksany thorough beginning construction on the site. 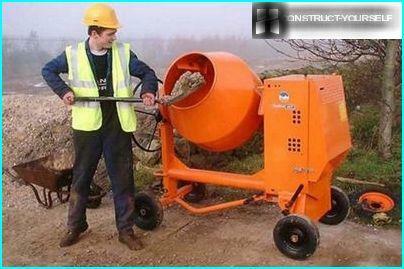 This sensible precaution to avoid trouble in the form of silt and so on. When choosing a place for a summer kitchen with barbecue, try to arrange it so that it does not interfere with anyone, consider the wind rose, so that later there was no quarrels with neighbors. 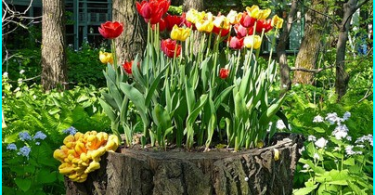 It is important that there were no trees nearby, have a strong root system that can further damage the foundation. The chosen land for construction should becarefully prepare. The surface should be straight, it is necessary to align if necessary. Now, based on the structure diagrams mark portion. Remove the fertile soil of approximately 20 cm: it will come in handy for other uses. We list all the basic tools and materials that could be useful. beams and planks for the roof device, roof covering. If, in accordance with the selected type of construction needed more any material proposed list could be extended. If the terms of the construction of public buildings, thefor it can be done, and columnar, and tape or solid foundation. It all depends on how big is the total weight of the structure. I would not want to design subsequently twisted. 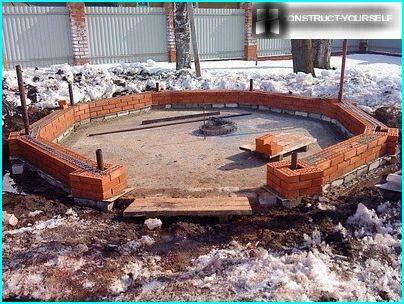 If, however, a brick gazebo will be gated, then there is no choice: we'll have to build a solid slab foundation. Pier foundation will be built only under thepillars on which will rest the roof structure. For walls, fireplace or barbecue you need a solid foundation, so even if you select tape or pier foundation under them have to do a solid foundation. 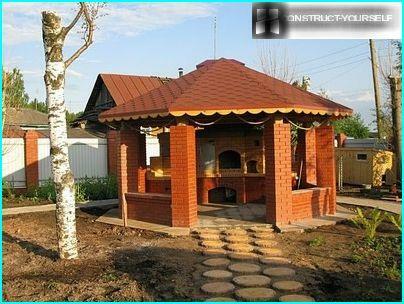 You can take a very nice brickhalf-open gazebo and build it with his own hands. For her, we need a solid foundation reinforced. Digs a pit, the depth of which will be not less than 1 meter. Do not forget about the summing up utilities. To construct the formwork is placed in a pit about 15 cm of gravel to form a "cushion". The surface of the rubble do smooth, compacted and cover a layer of waterproofing material. Grout prepare on the basis of the followingproportions: one part cement, three parts sand, and five pieces of rubble. Add water as needed, so that the resulting mixture is sufficiently fluid. 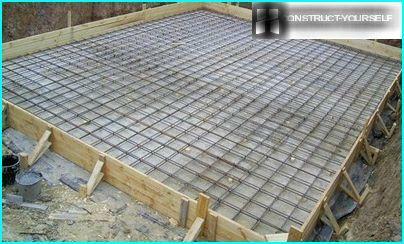 Pour about half of the desired height of the foundation of the future, then placed rebar, tying her part by a special binding wire. Pour the remainder of the solution and level it. 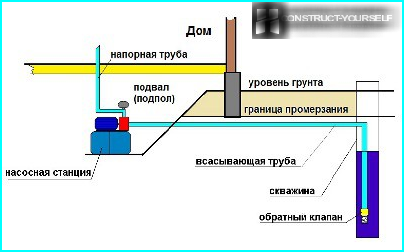 Immediately necessary to install pipes, whichwill serve as the center of the pillars that support the roof structure. Approximately 10-14 days to get the foundation will continue to gain strength. Do not let it dry out and crack. In stark concrete laid the first rowbricks. For this purpose, the base soaked masonry grout, consisting of 3 parts fine sifted sand and 1 part cement, laid bricks. Do not forget to apply the solution and on the side surfaces, and also to use a plumb and level building. On top of the first row it is recommended to lay a layer of waterproofing again. Next, layer by layer, continue to buildpillars and walls of the structure. There are several ways to brick masonry. 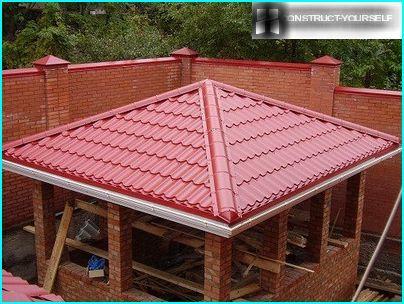 Summer kitchen open type can be performed in a half-brick masonry or in a grid of bricks when bricks are stacked to each other is not close, and through the gaps. How neat and beautiful masonry do, look at the video. 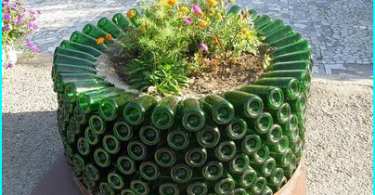 If the future is gated arbor orhalf-open, the most commonly used way of laying bricks 1. In this case, the bottom row of bricks laid one brick thick, so that the long side is positioned across the masonry, and the next series of bricks are placed perpendicular to the previous row of bricks. As it is necessary to spread the bars, showsOn the photo. In this case, the tube is placed around the four bricks. Between the pipe and the bricks formed space to be filled with cement mortar. Pour it must be in small portions. To attach rafters to the pipes supporting pillars, it is most convenient for them welded metal rods. More time on the formation of columns can look at the video. 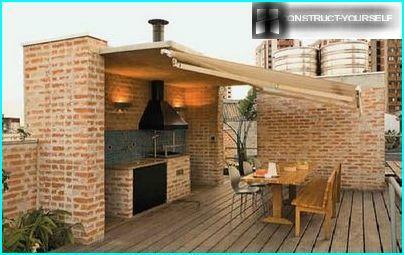 Internal works are in the floor unitgazebos and facilities fireplace or barbecue. In this case, one could not have done a barbecue, so get a full summer kitchen with three-channel tube, able to provide excellent traction. As a floor covering used neat paving slabs. Blind area around the building itself does not allow to accumulate around the rainwater, which can undercut the foundation. Roofs arbors can be very different. But in this case we are talking about a hip roof. To do it properly, you need to install temporary facilities in the center of the rack. Its purpose - to support the polygonal puck at the highest point of the structure. By the puck will be fixed rafters. The opposite ends of the rafters of the washer fixed on the pillars holding up the roof. To the roof structure was strong enough,at a certain distance (between one third and a half) of the total length of the rafters to install the cross. These should be attached additional truss bars. They are located right in the middle of each of the roof slopes, turning it into a kind of umbrella. For each ramp installation lathing is doneseparately. Crate looks like boards, tightly fitted to each other. The material for the roof to be cut out in the shape of triangles covering the roof sector, precisely according to their size. Joints can you arrange ready Ridge element or metal strips. They are mounted on top of the joints. Our structure is ready. As you can see, gazebo turned elegant, comfortable and very functional. Of course, in such a summer kitchen you will not see the New Year, but to celebrate the May holidays here will be very pleasant.